Red Bird and crew head to Tatooine as Luke Skywalker, Princess Leia, and Obi-Wan. Last week's teaser image, showing a light saber-wielding bird, left us wondering, but Angry Birds developer Rovio didn't make us wait long. 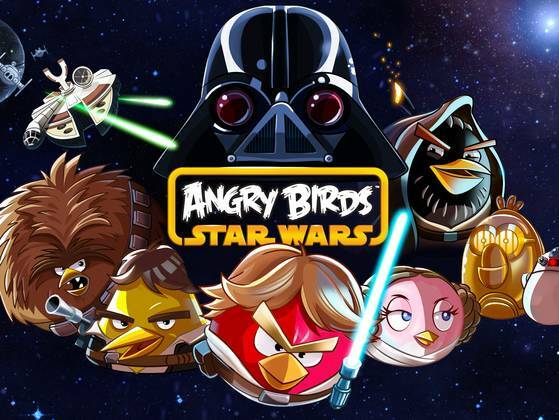 Rovio announced that Angry Birds Star Wars will be launching to iOS, Android, and "computers" on November 8th. The beloved fowl will be representing the light side of the Force, while their swinish counterparts will display the power of the dark side. Paul Southern, vice president of licensing and consumer products marketing for Lucasfilm Ltd. says, "They are not Angry Birds dressed up as Star Wars characters," rather, "They are characters in their own right." Southern went on to say, "They've got personalities which are kind of similar," so we'll be seeing bird versions of the likes of Han Solo, Obi-Wan, and Princess Leia as well as pig versions of Darth Vader and stormtroopers. Angry Birds Star Wars will also feature the gravitational physics seen in Angry Birds Space (where Rovio teamed up with NASA) alongside well-known environs from the Star Wars universe like Tatooine and Hoth. Without further information, it's difficult to say whether Angry Birds Star Wars will just be a reskin of Angry Birds Space, or if it will follow the story of the characters in some fashion. Rovio did, however, provide this image of the cast of characters in their Star Wars regalia. With Black Bird looking so sinister next to Vader, one has to wonder whether he's considering going over to the dark side.